And to share impressions and experiences about the 1916 Easter Rising. When studying abroad we tend to keep ourselves in our comfort zones by sticking with things that remind us of home. We form groups of people from the same nationality as ourselves just because it’s easy and familiar. As a consequence, we end up forming our own small communities abroad. It feels good at first to surround ourselves with people of similar cultural background. That’s because they give you a feeling of safety. New families can be formed like this, with people that you chose to share secrets and experiences. This happened to me during my first 15 months living in Ireland (from Sept 2013 to January 2015). I was lucky enough to meet and form a family with some great people from across Brazil. I am very grateful for the friends I made and the memories we share. But l recently realised that I could have done much more to learn about the country I was living in. Most people that study abroad are not fully aware of all the opportunities for personal development throughout this experience. Moving to a different country is an extremely challenging and daunting experience, but also one of the most rewarding. When accepting the challenge to really interact with a new culture we have the opportunity to learn so much about ourselves and the world around us. In short, we get re-educated from a whole new perspective. Opening your eyes to what is around you can really teach you a thing or two about your opinions and the way we interpret the world. It might even help you to realize something new about yourself. It certainly helped me. We have to remember that all our habits are a result of what we were taught by people who influenced us to believe was right. Since I allowed myself to see the world through other’s eyes I have become a more conscientious and dedicated person. And I can’t even fully convey how much my horizons have completely changed since then. We have so much to learn, and we can’t really take for granted the chance that studying abroad is giving us. On a daily basis, I get to interact with amazing and kind people of multiple nationalities and backgrounds including; my English housemate, Irish colleagues and all my other Italian, Dutch, German and Russian friends. I am very glad I can share my days with such special people because I learn something new from each and every one of them every time we are togetherI’m not talking about big lessons, but very simple behaviours unique to their various individual cultures like the things people eat or drink, and the time of the day you do so. Each of these experiences is special in its own way and they are helping to broaden my mind and horizons. However, learning to appreciate the simple things in life doesn’t necessarily make me forget the big events that I got lucky to experience. Which bring us on to the 100th anniversary of the 1916 Easter Rising. To those who are not aware, the 1916 Easter Rising represents the first major insurrection since the United Irishmen Rising of 1798. It marks the beginning of a strong opposition to the British government that led to Irish independence. 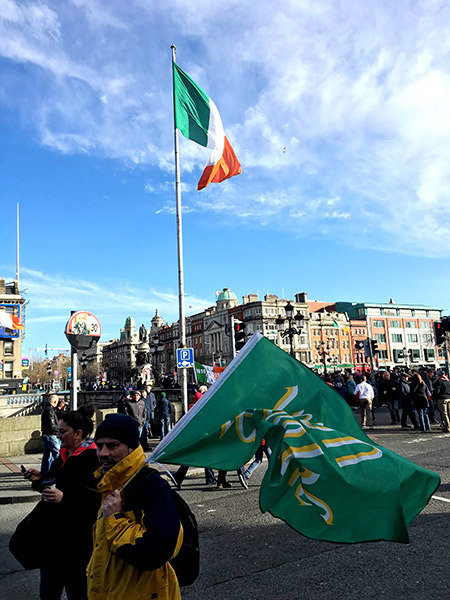 “At about 11.00 am on Easter Monday, Patrick Pearse and the Volunteers, along with James Connolly and the Irish Citizen Army, assembled at various prearranged meeting points in Dublin, and before noon set out to occupy a number of imposing buildings in the inner city area. These had been selected to command the main routes into the capital, and also because of their strategic position in relation to the major military barracks. They included the General Post Office, the Four Courts, Jacob’s Factory, Boland’s Bakery, the South Dublin Union, St. Stephen’s Green and later the College of Surgeons. There was little fighting on the first day since British intelligence had failed hopelessly, the properties targeted were taken virtually without resistance and immediately the rebels set about making them defensible. The GPO was the nerve centre of the rebellion. It served as the rebels’ headquarters and the seat of the provisional government which they declared. Five of its members served there – Pearse, Clarke, Connolly, MacDermott and Plunkett. The British army executed most of the participants of the Rising and loads of civilians, including women and children, were part of the casualties. It is a very sad event that reminds us of how much freedom is worth it. 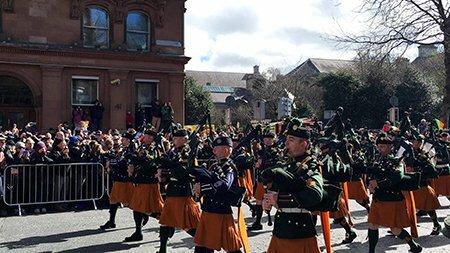 The parade was something different than the worldwide famous St Patricks holiday. It touched me even though I am not Irish. I started thinking about the real meaning of freedom, especially now that my home country (Brazil) is going through a very delicate moment. Our own population seem to have forgotten the lives that were lost to conquer our own freedom against the military regime (1964-1985). It also made me think about intolerance and the lack of empathy that is so common on the path that humanity seems to have chosen to follow. Let’s not take this moment of reflection for granted. After all, we are all different people with the same dreams. **And a Special thanks to my friend Dearbhlaith Larkin that has been revising the English since my first post.